Q: Hi there Mr. Pelozzo! My name is Omaira, and I have an 8 year old son, who I believe has natural talent with baseball. The reason I say this is because he tends to hold a bat and swingwith this incredible style; he is a good hitter. He is a good runner, has tremendous speed, good with his feet, he dives into bases. My son also has ADHD. My question is do you think that having ADHD is an impairment , or have other people with ADHD succeeded in baseball? Also I live in Bergen County NJ, is there a place where you would recommend that he go for an evaluation as a player, or somewhere he can go to further his talent, and love for baseball? A: Omaira – This is my 25th straight year as a major league coach and I can tell you I have had the pleasure of watching plenty of players like your son. We have a very productive star player on our team now that has the same thing. And I have been on other teams with very good players who have ADHD. So I would clear your mind of that issue and just worry about getting your son as much baseball as he can. 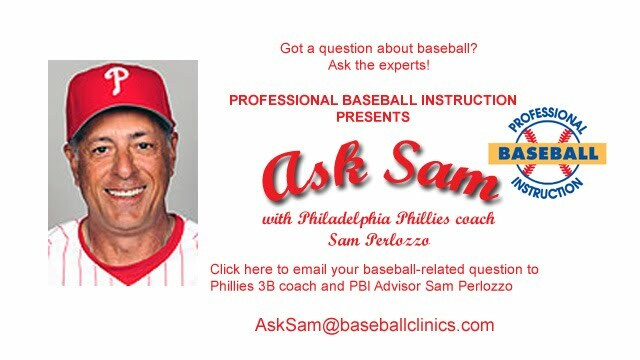 I would contact PBI to see if they can help your son with more exposure. PBI is very connected with all facets of the game and have a tremendous facility. I have done clinics there and I know they can help guide you in the direction you desire. A: Leonora – Sounds as if your son is moving in the right direction. He just needs to keep playing and learning. When he gets a little older, you can find places for him to play as much as possible. I will tell you that it sounds like he has the making of a good arm. I would tell him to play alot of long toss to keep his muscles stretched out and continue to build arm strength. Where most kids go wrong is not using what they have. Getting him around someone who teaches proper, healthy techniques that reduce the chance for injury would be a good idea. Allowing him to play other positions as well, is a good idea. That also helps him to develop other skills that he will need down the road. Sounds like he really just needs to keep playing as he is still young and developing. A: Kim – Interleague play can work both for you and against you. Seems like the luck of the draw. Each year alot of the teams you play are rotated and some are not. Drawing Boston, Yankees, & any other real good team makes it harder for you. Drawing teams that aren’t as good always works in your favor. It’s nice once in awhile to face some different teams and go to different cities, but the goal is always to win the most games. American league teams don’t like going to National league towns because they lose their DH and pitchers have to hit, which they aren’t used to.